I love admiring the colorful flowers all around my neighborhood. Flowers can add so much cheer to any sort of environment. Many plants and flowers can also add flavor to the dishes and beverages on your dinner table. 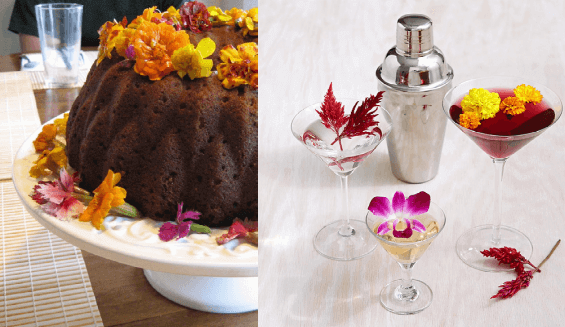 This week, I’m looking at how edible flowers and plants can contribute to the success of your next dinner party. Pansy Petals: One of the best things about these edible flowers is that they are easy to grow in a pot, a hanging basket, or your garden. 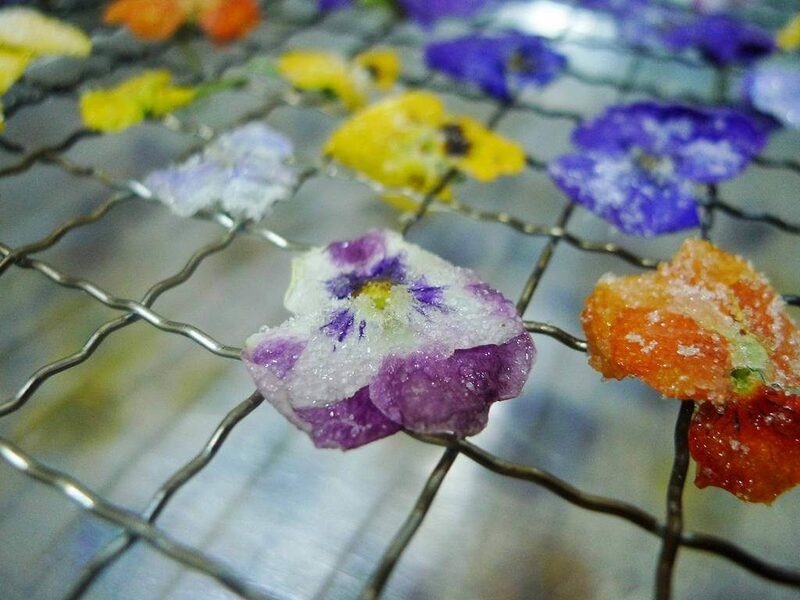 Pansy petals are best when eaten raw. Plus, you can eat a pansy’s stem and stamen as well as its petals. These flowers have a sweet taste that reminds me of wintergreen. Pansies are filled with vitamins C and A along with an antioxidant called anthocyanin. Try making Pansy pear gorgonzola bruschetta, a sweet-tasting bruschetta garnished with purple and white pansy petals. Or make a salad with all of your favorite vegetables and sprinkle some purple and yellow pansies on top to add even more color and flavor. Pansy shortbread cookies are delicious if you want to put a new twist on a beloved dessert. Lavender: It’s simple to grow lavender in a little pot in a sunny kitchen window. This makes it easily accessible when you want to dress up your dinner and drinks. I have a pot of lavender in my kitchen that I use to flavor my summer salads. Instead of serving plain lemonade to your dinner guests, try adding some dried lavender to create a pitcher of lavender lemonade. 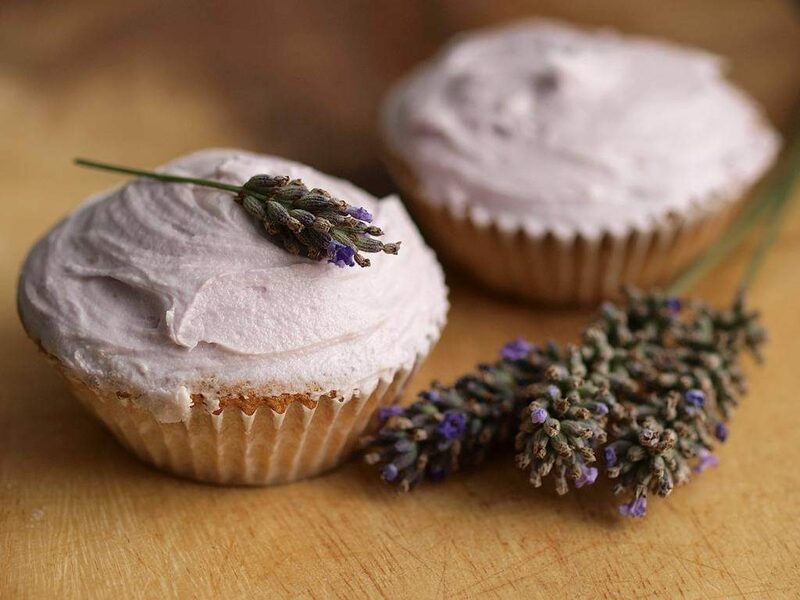 Lavender has a minty taste that can add spark to this traditional favorite. This flower is also great for jazzing up dishes featuring chicken, pork, or pasta. Lavender contains vitamin A, calcium, and iron. It’s best to strip the lavender flowers off the stalk and dry them so they are easy to mix in with other ingredients. Squash Blossoms: These edible flowers have a mild flavor reminiscent of zucchini. They are a familiar sight at local farmers’ markets. 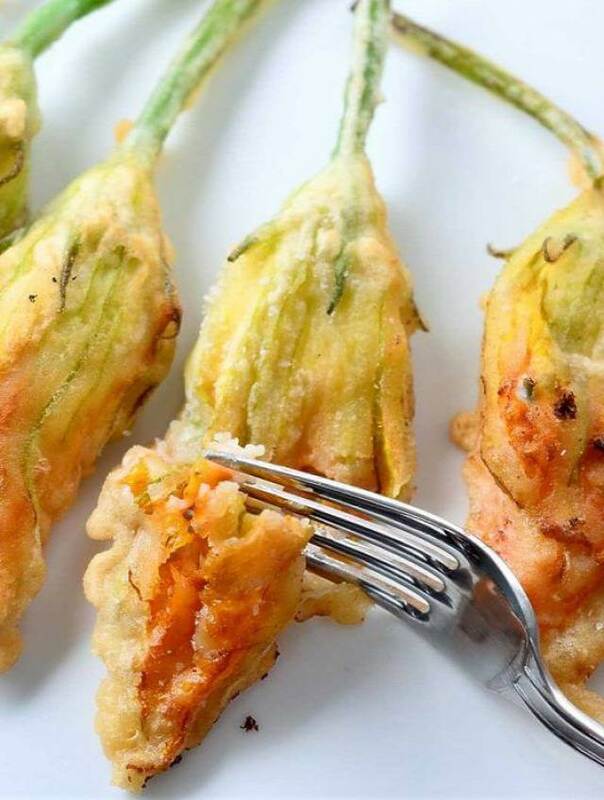 Squash blossoms can be prepared in a variety of ways, including baked, fried, or even mixed in with pasta. Many people like to stuff these blossoms with cheese, peas, or other small veggies. Squash blossoms supply you with vitamins A and C, iron, and calcium. Marigolds: Do you like a flower with a citrus flavor? If so, then you’ll love marigolds. Grow some in your garden or in a sunny spot on your patio. The brilliant yellow petals of a marigold add instant beauty to any dish or drink. 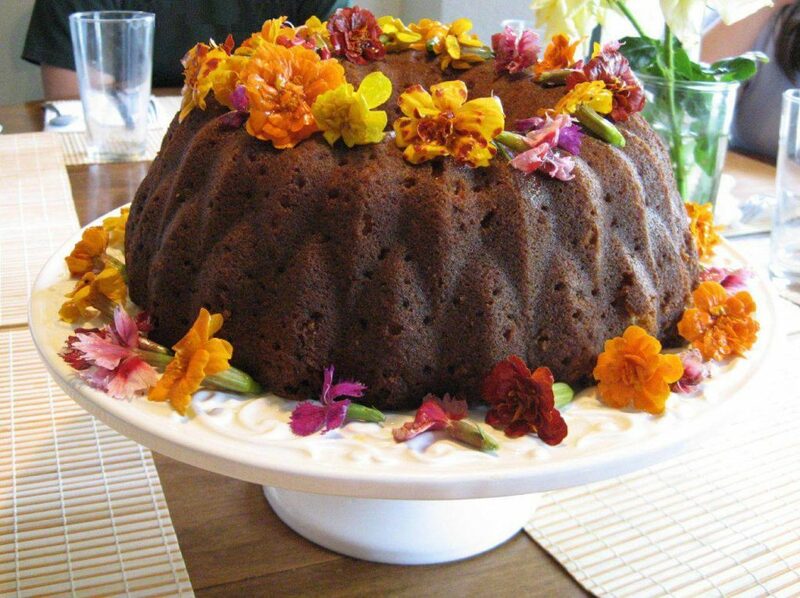 Make your favorite cheesecake recipe using marigold petals as a garnish. Or surprise your guests with some marigold cocktails. These flowers contain antioxidants and contribute to the health of your skin. Sunflowers: If you eat this flower in its bud stage, it may remind you of an artichoke. Steamed or boiled sunflower buds served with butter are a colorful, unique addition to any dinner table. Be sure to remove the green area around the bottom of the bud. Sunflower jelly served with rolls for dinner is sure to please your guests. An entrée of braised sunflowers is another imaginative idea for dinner. Sprinkle the bright yellow petals on your salads and give your guests a good dose of antioxidants and chlorogenic acid to improve liver health. 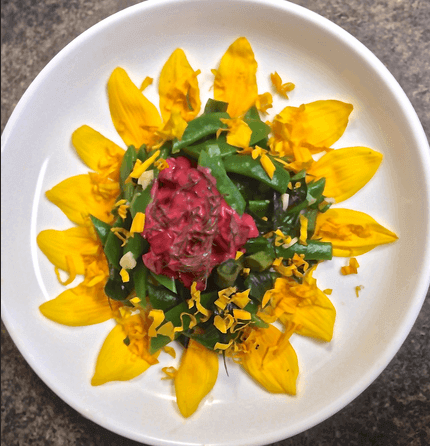 I hope you find that these edible flowers are just what you needed to make dinner and drinks with friends even more enjoyable this summer!